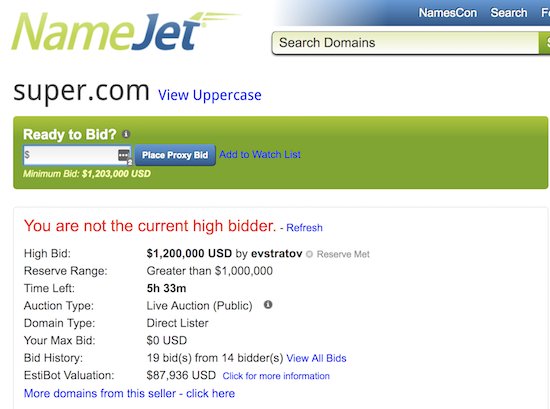 I do not recognize the leading NameJet bidder alias, evstratov. It is possible that the high bidder signed up specifically for the Super.com auction or perhaps the bidder is not a regular NameJet auction participant. Whatever the case, I presume the bidder has been verified. The Super.com domain name auction, as well as the other domain names in the extended auction, wraps up later on today. The largest sale in the live auction was Great.com, a domain name that sold for $900,000. Assuming Super.com sells for $1.2 million or more, it would be the largest domain name sale of the year. Thanks to Michael Bilde for bringing this to my attention. Update: Super.com sold today for $1.2 million. Thanks Elliot! Yes this is an end user I have been negotiating with for some time. Its going to be a great overall auction! One of the best I have done. I expect several sales after this extended auction as well. Great.com, Super.com were best domains in auction imo. Truly one of a kind domains. Opportunity to buy will probably not arise again for long time. Congrats to buyers and sellers assuming they close.